Aquaculture sits at the intersection of a great many areas of interaction with the sea: it involves food supply issues, environmental concerns, and the combination of craft knowledge and academic science. 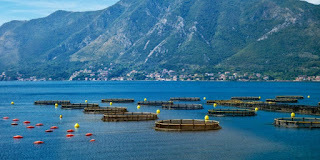 My next couple of posts will be about aquaculture and the difficulty of actually separating many of these concerns. 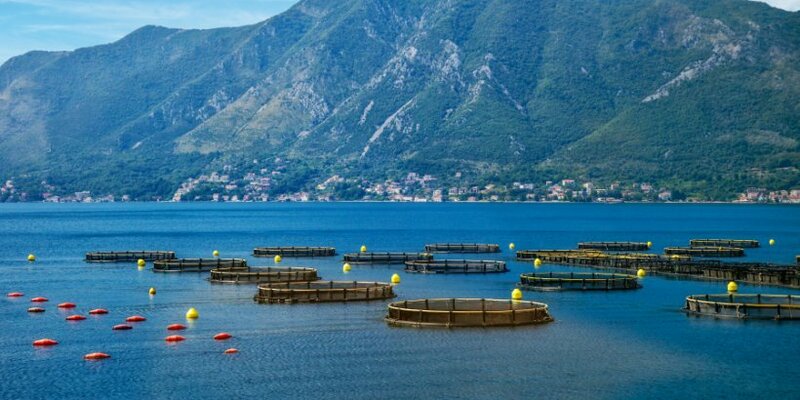 Aquaculture is the process of farming aquatic species for human use. These uses take the form of food for human consumption, food for agricultural consumption (for crops and animals), and ornamental purposes. At the risk of sounding like an undergraduate research paper (written hastily between 10pm and 1am), the history of the practice of aquaculture is almost as old as time. Archaeologists have shown that early human civilizations had both the ability to catch aquatic species, but also worked to increase their production through human built systems. Ancient Asian, Roman and Greek, and island (what is now Hawaii) communities are known to have built both freshwater and saltwater ponds to hold and breed fish. Early humans in what is now the Pacific Northwest built "clam gardens" on the coast to increase clam production and maintain a constant supply of the shellfish for consumption. Later, specific tools and techniques, including the use of cage culturing in China during the Sung Dynasty (AD 960-1280) expanded aquaculture production. The middle of the 19th century saw an increase in aquacultural research throughout the world and the craft knowledge developed over centuries was combined with the systematic biological experimentation growing at Universities. Combining these forms of knowledge pushed aquaculture forward rapidly. Traditional aquaculturists had great success in production on a small, local scale. By incorporating biological research on metabolism, virology, bacteriology, morphology, physiology, and behavior, aquaculturists could streamline the process of production. Understanding physiology and behavior could streamline reproductive cycles, helping culturists produce more generations more quickly. Virology and Bacteriology identified diseases of farmed species and worked to protect them from outbreaks. Production of previously farmed species exploded, as did the number of species able to be cultured. 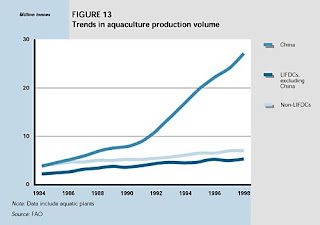 Today, aquaculture is a growing industry. 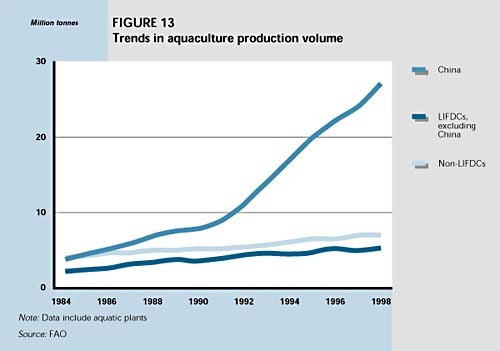 It is difficult to find specific numbers before 1950, but but the chart below shows the increase in aquaculture by volume from 1985 to 1998. Since 1992, the United States has actually decreased their aquaculture. However, Korea, Norway, and Chile have increased exponentially. The interactive map and graph here are pretty awesome. That data is interesting to look at, but it doesn't include any information about China- the largest producer of aquacultural products in the world. There are several species that dominate international aquaculture: trout, salmon, tilapia, catfish, and shrimp. We can farm other species, including a variety of shell and fin fish and mollusks, as well as ornamental species, but for human consumption, those are the big 5 and account for the majority of resources spent on aquaculture. Each of these species has a different issue that has been associated with problems in the industry. - Farmed salmon has proved to be a breeding ground for sea lice and might spread the vermin to wild populations. In addition, a recent outbreak of sea lice in Scottish and Norwegian salmon has caused a surge in international prices. - trout, tilapia, and catfish are generally farmed in poor conditions; overcrowding and antibiotics needed for that overcrowding leach pollution into soil and generally damage the sensitive coastal ecosystems where they have traditionally been farmed. In addition, the clearing of mangrove swamps and other coastal systems to build these farms has been noted. - shrimp has similar issues to the finfish above, but the largest problem noted with the shrimp industry is the issue of modern day slavery. One of the most important additions to the traditional knowledge of culturists was the study of metabolism and nutrient research. In my archival research at the National Archives, I looked through the fisheries records for the Davenport, Iowa USBF station and found a lot of conversation about what to feed fish. Fish (I'll be talking primarily about fish culturing for the rest of this entry but I'm happy to answer questions or write about shellfish aquaculture in the future), especially the species humans like to eat, mostly eat other fish. For instance, trout- a commonly farmed fish- eats crayfish, smaller trout, and insects. The question: how do you mirror the diet of a wild fish in captivity? For ornamental fish, you can find a mixture of things for them to eat- as long as they are fed and thriving, no worries. But there's a problem with feeding farmed fish for food- you want them to taste "good" (not too fishy I'm told) and to have the texture and color of their natural brethren. Much of that texture, taste, and color come from diet. The most prized fish and crustaceans get their firm flesh, color, and taste from consuming other fish and crustaceans- all the Omega 3's we've been told so much about comes from fish oil and flesh. So major farmed species like trout, salmon, and shrimp eat other fish- and a lot of it. The question throughout the 20th century has been- given the metabolism and dietary needs of these highly prized species- how can we feed them efficiently? At Davenport- they worked to develop what we now use to feed farmed fishes- a dehydrated, compressed biscuit made up of fish meal, fish oil, and supplemented with corn, soy, or other fillers (sometimes saw dust is even included). The requirement of fish oil and fish meal is where the knot, the intricacy of aquaculture, tightens and tangles. Fish meal is the name given to processed fish that has been ground finely and dehydrated. If you garden, you might have run into fish meal as a fertilizer high in phosphorous, nitrogen, and potassium. If your mind is immediately flashing to the picture of Native Americans putting fish under their bean and corn plants, that's common. The story of Squanto teaching the English this traditional practice isn't completely wrong--he did teach them--but apparently he learned from other European settlers. But I digress. Fish meal is useful for gardening, but it is also an important component of aquaculture because it mimics the natural diet of apex predators. Fish like salmon eat smaller fish and their taste, texture, even their smell is dependent on a diet that is as close to that natural diet as possible. Fish oil is the other important component of a farmed fish's diet. Fish meal provides the bulk of the nutrients (and just the bulk of food in general) required for a fish to thrive in captivity, but fish oil is what really makes apex predators taste good (and gives them the Omega 3s you've heard so much about). Obviously, a lot of fish oil goes into the market to be consumed by humans, but a good amount of fish oil goes to fish farming. Without the oil, farmed fish would not thrive. By the middle of the 20th century, researchers had generally worked out what to feed farmed fish to keep them alive without overfeeding them. But the issues involved in fish feeding have been multiplying in the last 10 years as aquaculture requires more and more fishmeal and oil from an ocean with depleted fishstocks. The next blog entry will talk about the current science and debates about feeding farmed fishes. WhatYouSea sells coral frags on the internet for people with saltwater aquariums. A coral frag is a small piece of live coral that a person can add to their tank,and grow out. The niche should be blogs related to saltwater aquariums, and coral propagation and sales. Let me know if you need more information. if you want more just look here "Coral frags"